Ok, I give in. We are in November and even my thoughts are turning towards Christmas. With money being tight, I am looking for little stocking fillers which are also not going to cost the earth to post. I have made some bookmarks using scraps of card left over from making soap boxes. There are three different designs. Design 1: Crumb Cake cardstock, matted with Very Vanilla and stamped with the En Francais stamp from Stampin Up in Crumb Cake ink. Design 2: The Mosaic Madness stamp and punch have been used with Perfect Plum and Primrose Petals cardstock and ink with a couple of rhinestones for embellishment. Design 3: Old Olive and Crumb Cake card stock matted with Very Vanilla, stamped with Old Olive and Crumb Cake ink using the Summer Silhouettes stamp set. 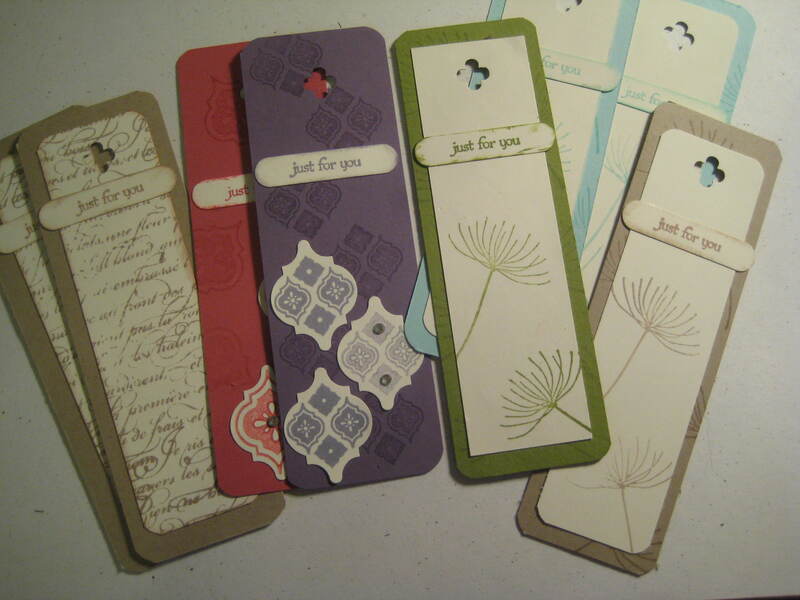 I have used the “flower” from the Itty Bitty Punch set to add detail to the top and all the bookmarks have a sentiment from the Itty Bitty Sentiments set punched out with the word window.